A newly-freed Marco Contreras hugs his father. 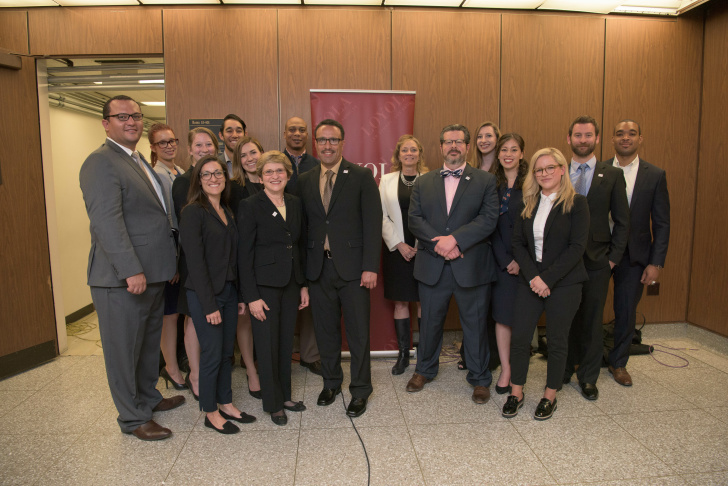 Marco Contreras with professors and students from Loyola Law School's Project for the Innocent. In September of 1996, a man walked up to Jose Garcia as he was pumping gas in Compton and shot him in the face. Garcia ran and dove underneath a car. The shooter followed him and fired several more shots before escaping in a car that was waiting in a nearby alley. Garcia survived but had a hard time identifying his assailant. The best witness was Alicia Valladolid, who was in her car at a red light across the street. She wrote down the getaway car's license plate, and police tracked down its owner, Miguel Contreras. At Contreras' preliminary hearing a month later, as Valladolid was waiting to testify, she spotted Miguel’s younger brother Marco sitting in the audience, and identified him as the man who shot Jose Garcia. Detectives arrested Marco and he went on trial for attempted murder and attempted robbery. Marco, who worked the graveyard shift as a hospital security guard, said he was across town asleep at the time of the murder. The jury didn't buy his alibi, and found him guilty. The judge sentenced Marco – then 21-years-old – to life in prison. Contreras' shocked family frantically sought help. His parents – Mexican-American immigrants – asked the Mexican consulate for help. They pleaded with police to reopen the case. They got nowhere, and his court appeal failed. For 14 years, Marco languished in prison with little hope of ever winning his freedom. Then one day in late 2011, his parents sought help at a community legal clinic. 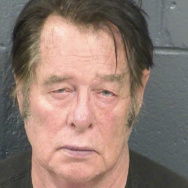 It was a longshot, since the clinic didn't handle cases like this. But they got lucky: one of the clinic's lawyers, Ricardo Perez, had gone to law school with Adam Grant, who at the time was deputy director of the newly-opened Loyola Law School Project for the Innocent. Perez reached out to Grant, who says that "when the case was brought to us and we looked through the file, it was pretty clear that something was terribly wrong." At the project, 20 law students work on cases under the supervision of two professors. One of the students assigned to Contreras' case, Dinora Perez, says one of the first things she realized was that the lawyer Marco’s parents had hired failed to investigate the shooting. Had he done so, he would have found a problem with the eyewitness’ testimony, she says. Standing at the scene of the crime, Perez says team members measured the distance from the spot of the shooting to Valladolid's car. It was 200 feet, "a far distance for someone's face to be recognized," she says. "In addition to the distance, the whole time she was seeing them, they were in action," adds Perez. "They were running around, moving around so that makes it even harder for her to get a clear view of the two men." 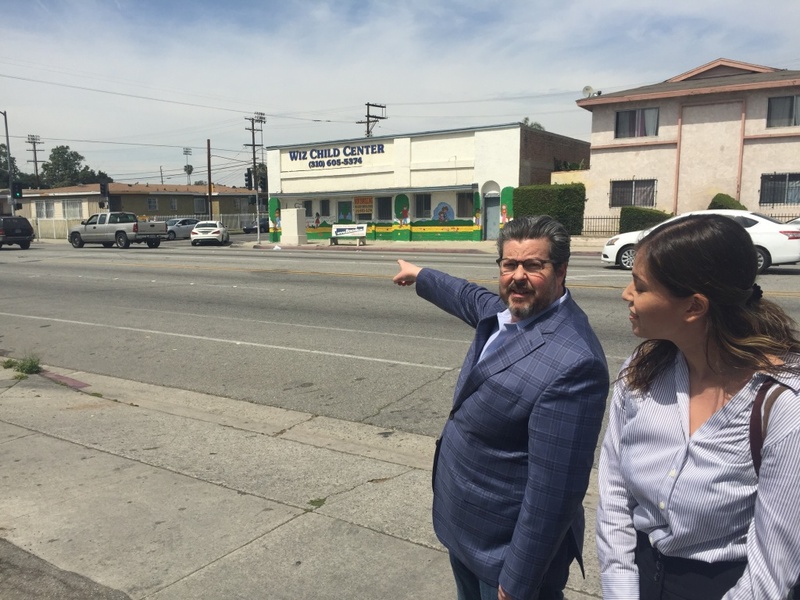 Loyola Law School Project for the Innocent Director Adam Grant and law student Dinora Perez near the scene of the shooting that landed Marco Contreras in prison. Grant says there was another, obvious reason why police and prosecutors should have been skeptical of Valladolid's identification of Marco Contreras. "Why would a guy go to a preliminary hearing for his crime partner where the witnesses were going to be?" he asks. Under Grant's guidance, the team of students met weekly, analyzing police reports, re-creating timelines and tracking down witnesses. Perez re-interviewed one witness who was near the gas station during the shooting and found a common problem in these types of cases. "A lot of the crimes are so old, people just don’t remember," she says. There was another major problem with the case beyond the witness' identification, says Grant: A key piece of evidence never made it into the record. "There was a detective who had given a statement years earlier that he no longer had faith that they convicted the right person," he says. In fact, it was the lead detective on the case, Fred Reynolds. He gave his declaration in 1998, a few months after Marco’s brother Miguel was released from prison after serving time for being the getaway driver. Under pressure from his parents, Miguel had visited Reynolds. "Based on what Miguel Contreras told me, as well as my continuing investigation of the case following Marco Contreras’ conviction, I believe Marco Contreras was not the real shooter," Reynolds said in his declaration. "I believe the real shooter is a man named Antonio Salgado, whose photograph appears similar to Marco Contreras," he added. That was in July of 1998, the year after Marco's conviction. But a second lawyer hired by the family never filed the detective’s declaration with the court. "There is so much that could have been done, but wasn’t," Perez says. Reynolds, who currently works at the L.A. County Sheriff's Department, declined to be interviewed for this story. Loyola eventually brought all of this to the L.A. County District Attorney’s office – to the very prosecutors who helped put Marco behind bars. The DA, together with the sheriff’s department, launched an investigation. During that investigation, prosecutors and Loyola attorneys jointly interviewed Miguel Contreras, who told them Salgado was the shooter in a murder-for-hire over a drug deal gone wrong. He said he didn't finger Salgado when Marcos was on trial out of fear of retaliation. Others involved in the scheme also identified Salgado, who had fled to Kansas City, Missouri in 1998. 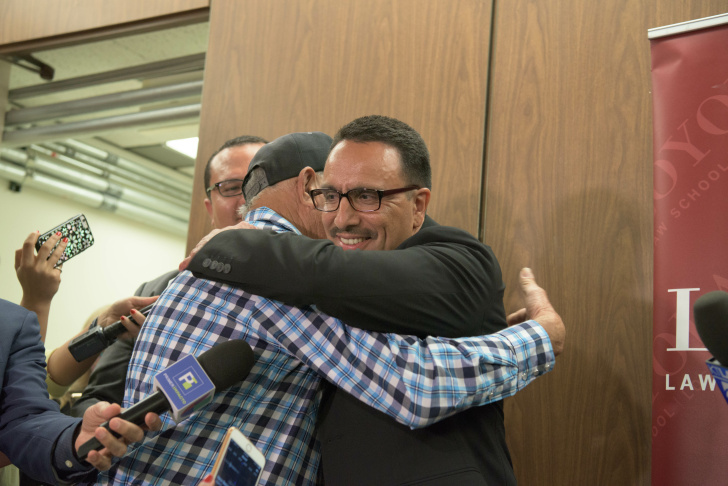 Finally, more than five years after the innocence project learned about Marco Contreras' case, prosecutors from the DA's office and Loyola attorneys went to court at the end of March to ask a judge to free him. The judge declared the now 41-year-old Contreras innocent and ordered him released, to the cheers of his family and Loyola students. Marco had spent 20 years behind bars. "I’m still soaking it in," he said outside court. "It’s a joyous day." By then, authorities had arrested and charged Salgado with the shooting. 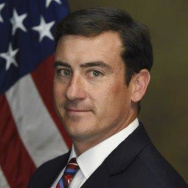 "Really, without Loyola getting involved we never would have gotten to the point we are now," says Deputy District Attorney Bobby Grace, who heads the office’s newly created conviction review unit. While Loyola's Project for the Innocent has been around for six years, until March it had won the freedom of just two men. Then over the course of a month, it won freedom for Contreras and two other men: Andrew Leander Wilson served 32 years for murder after a conviction based largely on an eyewitness police knew was unreliable. Jaime Ponce spent 19 years in prison for attempted murder; his conviction was based in part on a witness who said police pressured him to finger Ponce. Freedom doesn't always come with a declaration of innocence. In Ponce's case, the DA agreed to support his release after time served in a deal that sent him back to Mexico. He was in the country illegally. Still, "three victories in a month is phenomenal ," says Justin Brooks of the California Innocence Project, which is based in San Diego. Over 18 years, that project has won freedom for 26 people, he says. "It’s extremely difficult to get a case re-opened." "There’s a lot of heartache when you can’t gather the evidence, even though you know they’re innocent," he adds. Each year, Loyola receives hundreds of requests for help, says Grant, who is now the program’s director. At any one time, the project is actively working about 40 cases – mostly murders and attempted murders in the L.A. area. It’s a relatively small project – The Innocence Project in New York, founded in 1992 by professors at Cardozo School of Law to use DNA to win exonerations, boasts 75 staffers and a board of directors that includes former U.S. Attorney General Janet Reno. It has secured the release of 340 people. The California Innocence Project has eight staff attorneys and 12 students. Nonetheless, Loyola Professor Laurie Levenson, who oversees the Project for the Innocent, wants to create "the premier center on the west coast committed to addressing hot criminal law issues." There's a critical need for innocence projects, says Grant. He points out that individuals who have been convicted and turned down on appeal aren't eligible for government-funded legal help, so they must rely on their own devices to win their release. And trying to overturn a conviction is "one of the most complicated areas of law," says Grant. Success requires a "herculean" effort, he adds. Loyola's innocence project relies heavily on its students, says Grant. "We really have to encourage students to take ownership of their case and bug us about it," he says. "They really have to start being advocates from the first day." In the Contreras case, law student Perez felt the pressure. "It’s an actual person we are dealing with," she says. "It’s not just a case we are reading in class. That’s what makes it very nerve-wracking, very intense." How many wrongfully convicted are in prison? There’s hot debate about just how many innocent people may be sitting in California prisons. Prosecutor Grace says he believes it’s a minuscule number – and that he thinks Loyola and other innocence projects won’t win many victories. "We would hope they are spinning their wheels [in most cases] because the system has worked," he says. Loyola’s Grant points to a federal study that found fully 4 percent of inmates on death row are factually innocent. And there have been 1.994 people exonerated in the U.S. since 1989, according to UC Irvine's National Registry of Exonerations. It says 2016 saw the most in that period: 166. One study found the most common reason for wrongful convictions is eyewitness misidentification. Other reasons include bad lawyers, police or prosecutorial misconduct and false confessions resulting from coercive interrogations. This year, it got a little easier in California to win the release of someone who was wrongfully convicted. Governor Brown signed a law that relaxed the standard regarding new evidence used to prove innocence. Those appealing their convictions no longer have to undermine every single part of the case against them. "So I think a lot of cases are going to get reopened," says Brooks of the California Innocence Project. "In fact, we immediately filed a case that we lost before and we won under the new standard." That means more work for Loyola’s Project for the Innocent and its students, like Dinora Perez. "To know that someone can be convicted on such little evidence, it’s upsetting," she says. "But at the same time it gives me motivation to pursue this career because I want to be able to assist people in what might be their darkest moments." Perez says because of her work at the innocence project, she plans to become a public defender.